Like it or not handcuffs play an important role in modern society. There aren’t many, if any products that were designed in the early 1900’s that are still being used today in almost identical form to the original. 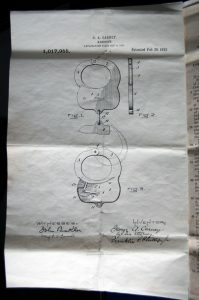 The modern handcuff design was patented in 1912. These handcuffs featured a swinging arm that can rotate all the way around a pivot and through the double strand that makes up the body of the handcuffs. This feature along with a cleverly designed simple locking mechanism made restraining criminals much safer for officers than rugged Darby style handcuffs. The keys those handcuffs used are strikingly similar to that of a modern handcuff key. Early Peerless handcuff keys were not hollow like their modern day counterparts. They instead featured a “post” at the end of the bit that would fit into a small hole on the opposite side of the handcuffs keyway. These early swing through handcuffs were manufactured and most widely used for the next 20 years. In 1932 the Peerless Handcuff Company released the next version of their already popular design. These handcuffs were more streamlined than the originals, and they also featured what we know as a universal handcuff key. 85 years later these keys would still open a pair of handcuffs coming straight off the assembly line. Although virtually all the handcuffs used by a street officer use the same key, these restraints are still extremely secure. Due to the positioning of the keyhole and modern handcuffing techniques it is extremely difficult to escape a pair of handcuffs, even if the criminal has access to a key. 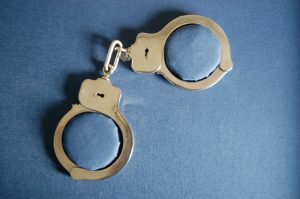 A standard pair of modern handcuffs is constructed of nickel plated carbon steel. Nickel plating helps protect the raw steel from water and oxygen, preventing rust from forming. There are now many different finishes manufacturers employ to protect the metal handcuffs are constructed of. Smith & Wesson has a popular finish they call Melonite. Melonite is a process that turns metals black, and also creates a barrier that goes deeper into the metal to prevent oxidation. Another similar method used by Smith & Wesson, Peerless and other manufacturers is Bluing. More recently manufacturers started color coating their handcuffs. Smith & Wesson made some for a few years with a Weathershield coating, a very durable paint that they also use in gun manufacturing. Peerless employs an electrolytic polyurethane process to color plate their restraints. CTS powder coats their handcuffs. ASP uses colored polymer over molds on their colored handcuffs.